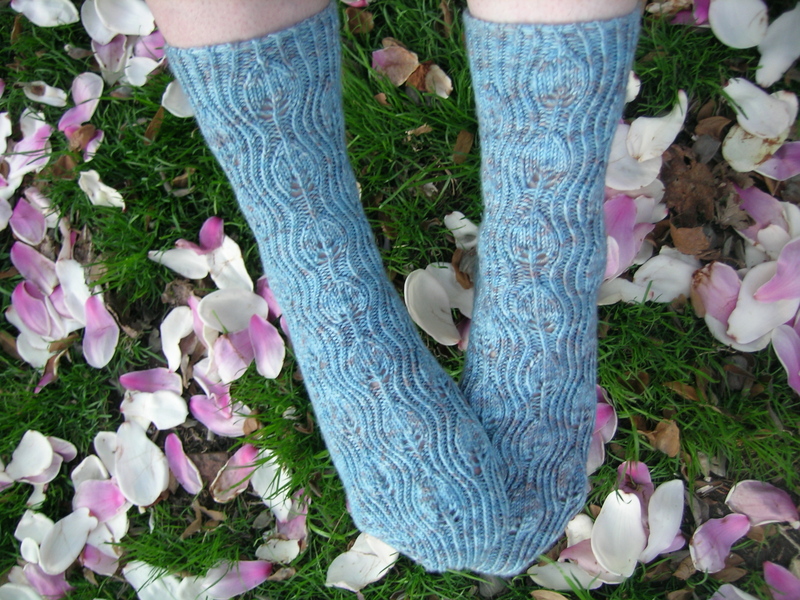 I finally finished these mystery socks from the Knitterati Sock club. 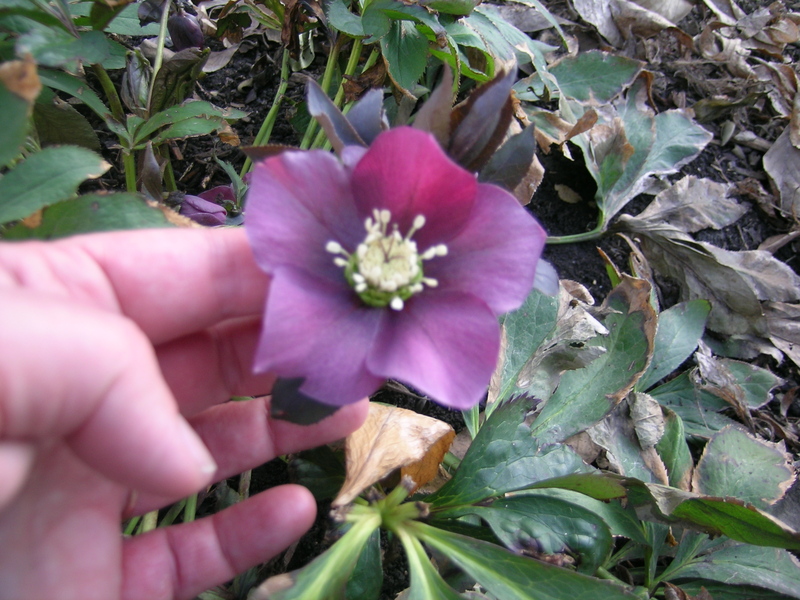 The given name was Provence, which I love, having lived a year in Aix-en-Provence during college. 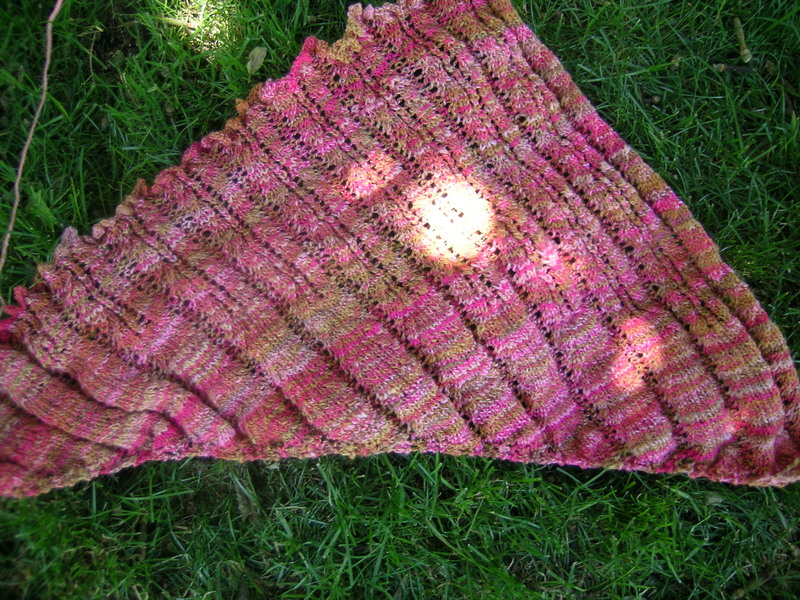 Very pretty and soft, it was a fun knit. 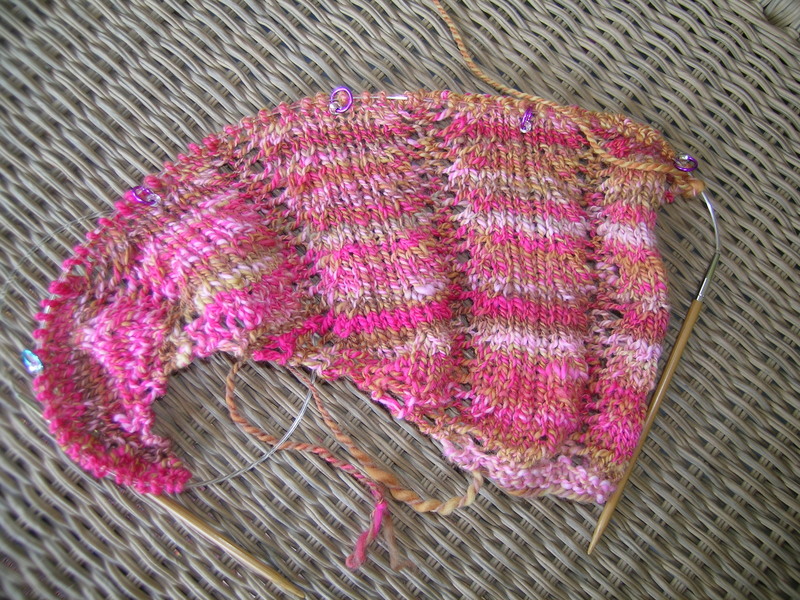 This was a mystery knit where the clues were doled out one week at a time. 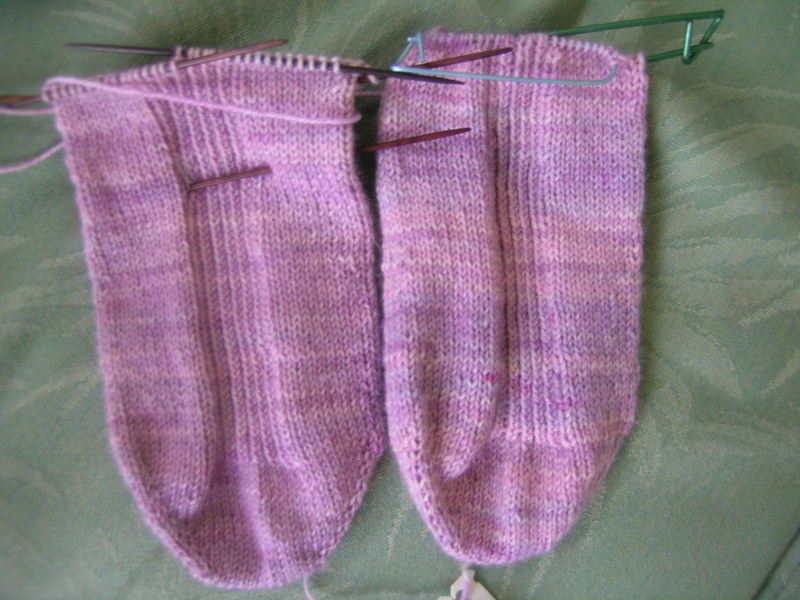 The sock was knit from the toe-up and called for the EZ sewn bind-off at the end, my only change was to do my favorite tubular bind-off instead, I think that it is stretchier and has a better finished look. 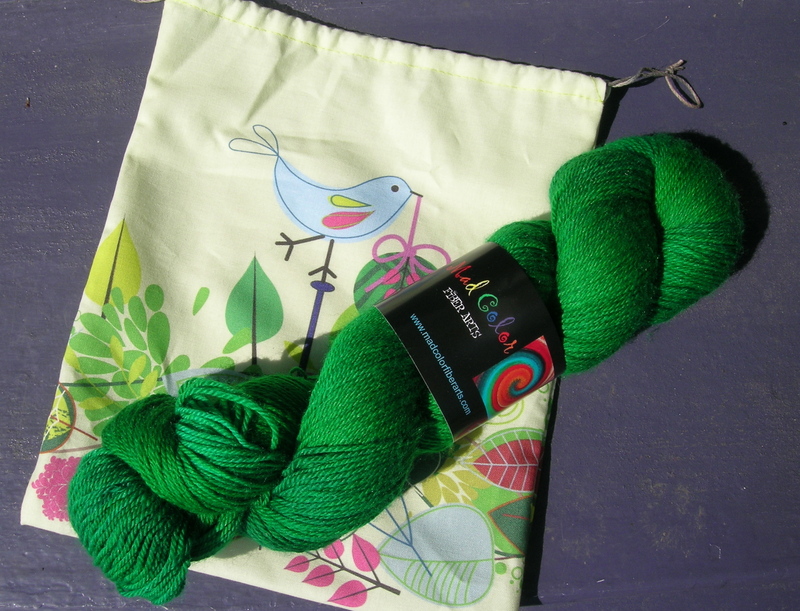 The yarn was enjoyable to knit with and I would definitely add this to my approved yarn list. 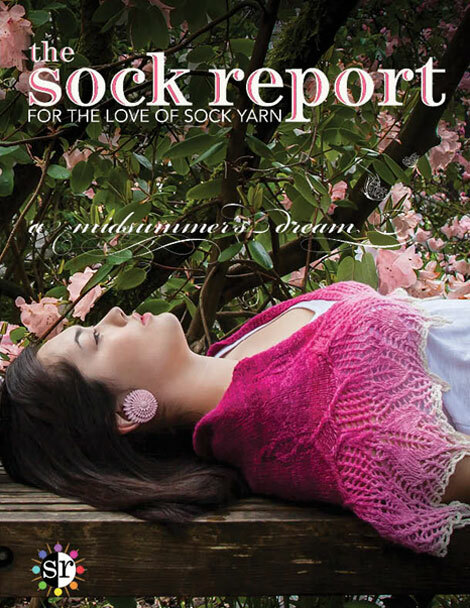 I know that we had a pair of socks from the CookieA sock club last year, also from this vendor. I love the color of those socks!!! Love the pattern too. Perhaps someone can help me here. 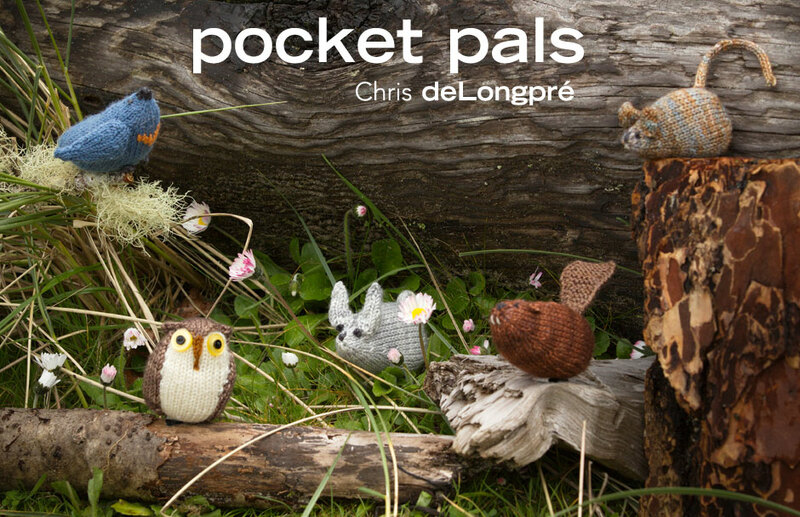 Having watched a couple of Knitting Podcasts, some recommended by fellow knitters, I do not understand the appeal, nor why advertisers would pay for this. Some might say the same about my blog, but you can just quickly look at the photos and don’t have to hear cats barfing in the background or the inane babbling of the host, or worse the showing of items on their iPad by bringing it closer to the camera lens. Trying to watch one the other day and I felt like it was watching a train wreck in slow motion. I love blogs with video, especially when it is explaining a technique, and I enjoy looking at the photos on blogs. There is one blogger I follow where I only look at the photos, she is a great photographer, but I could never read her text—too cutsie. 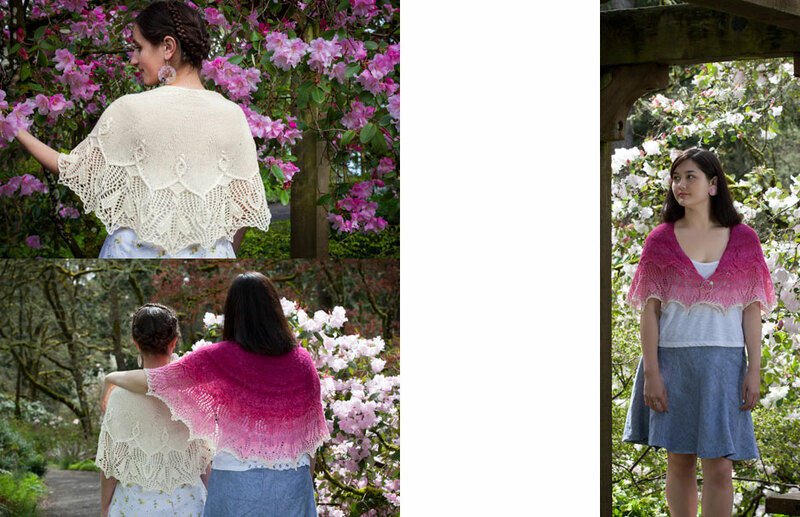 I finally blocked out my Little Wing shawl by Janel Laidman. 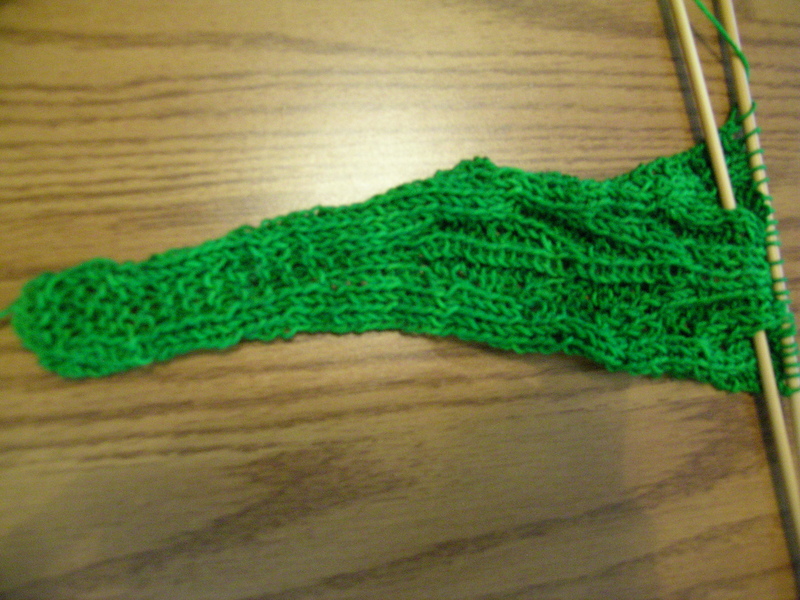 I wish that I had more yarn to make it bigger, but it did block nicely. 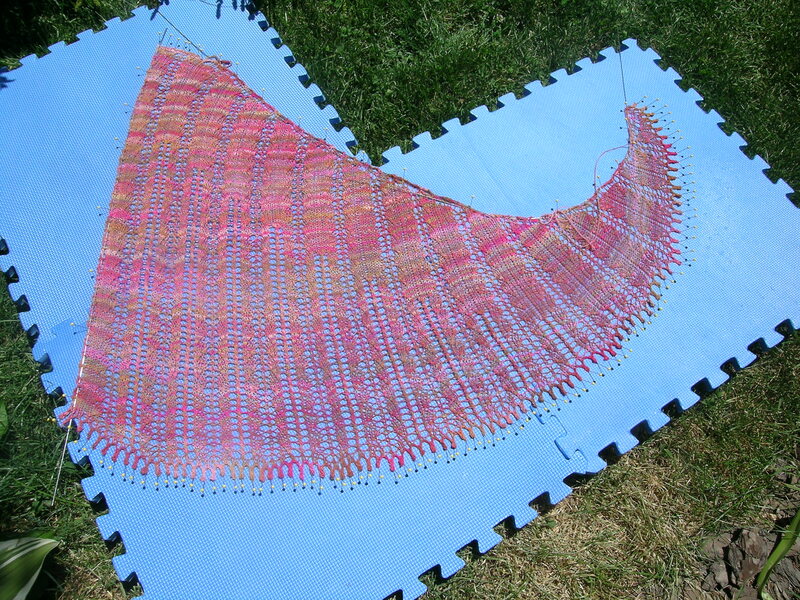 It is drying outside on this beautiful day, and I will have finished photos later today. I know exactly what you mean – and I only did audio podcasts! I do like Fiber Beat, because Wonder Mike does actual interviews. I think it is only available in audio. We drove to Detroit this past weekend for a party, and when I was not driving, I got quite a bit of knitting done. 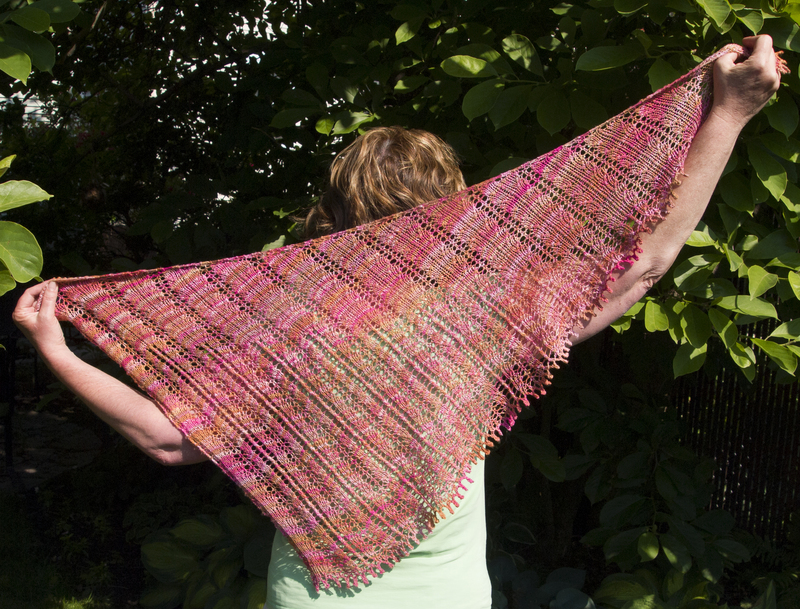 First I finished the Little Wing shawl by Janel Laidman, which was the featured pattern in the Knitterati club this month. 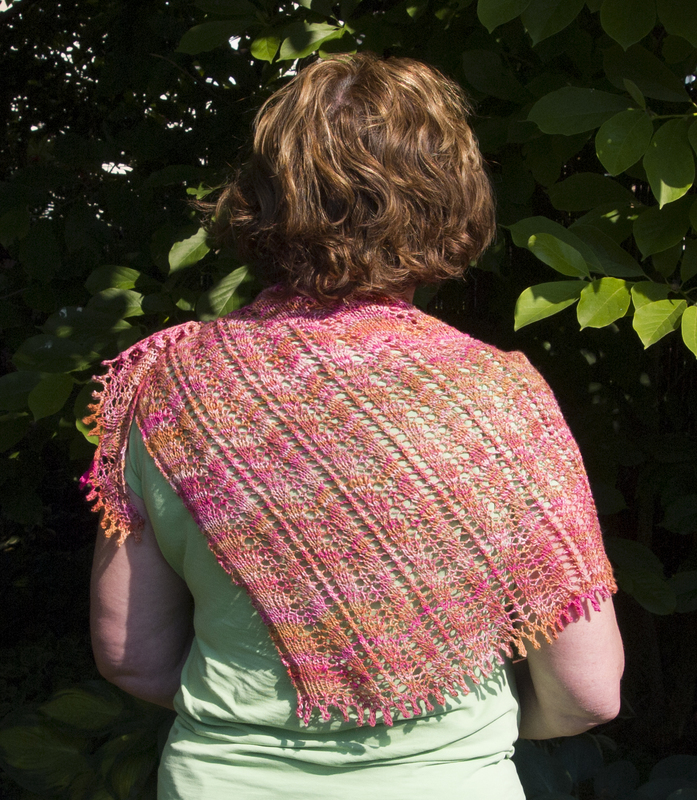 I chose to use some of my own handspun, which was from a Fiber Optic pencil roving called Honeysuckle Rose. 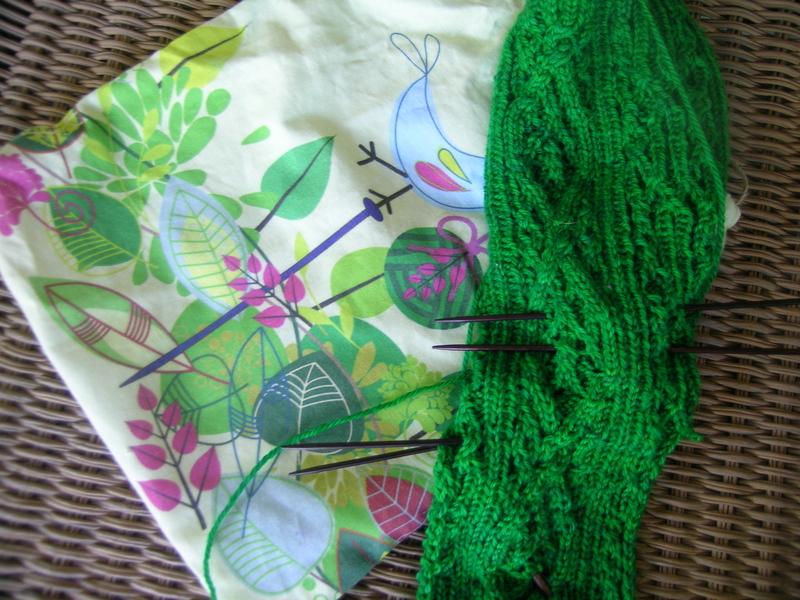 I had exactly 400 yards, the pattern yarn was only 410 so I thought that I would be good. 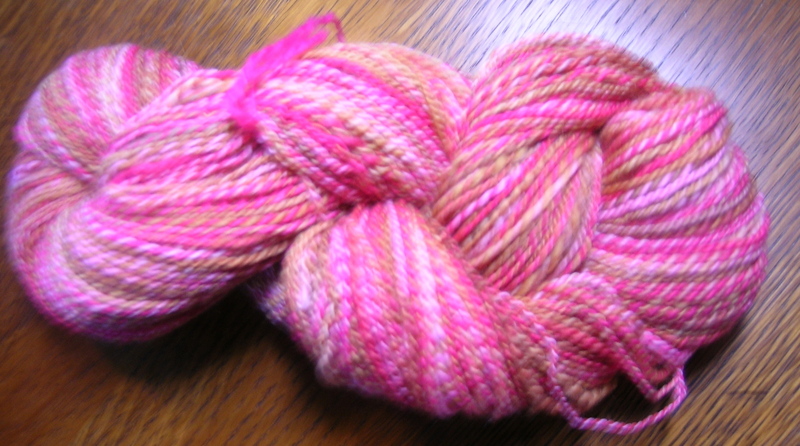 First, my yarn was a bit uneven, hopefully I have gotten better since spinning this. 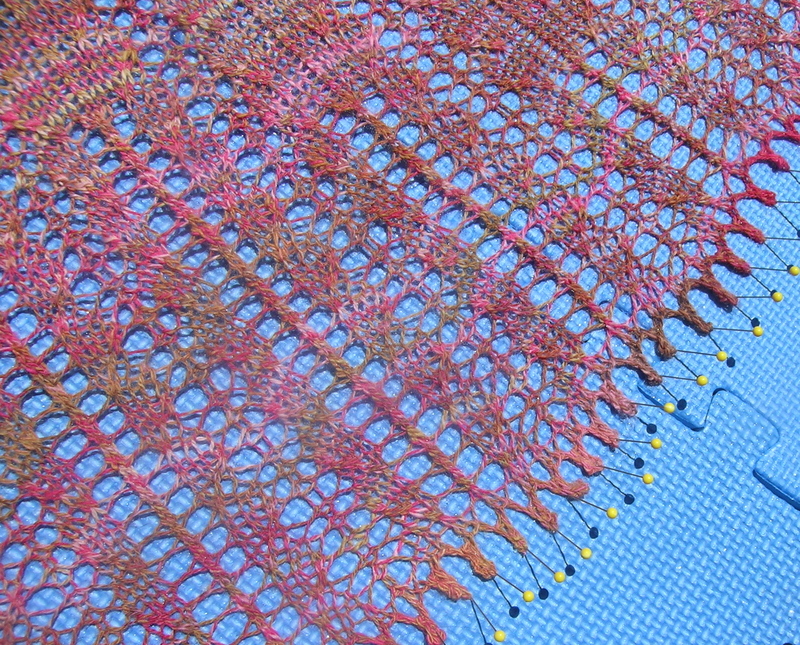 The pattern called for 12 repeats of the lace section, I was able to get 10 1/2, and only had 10 inches of yarn left. I was calculating how far I could go with my yarn and I maximized it. 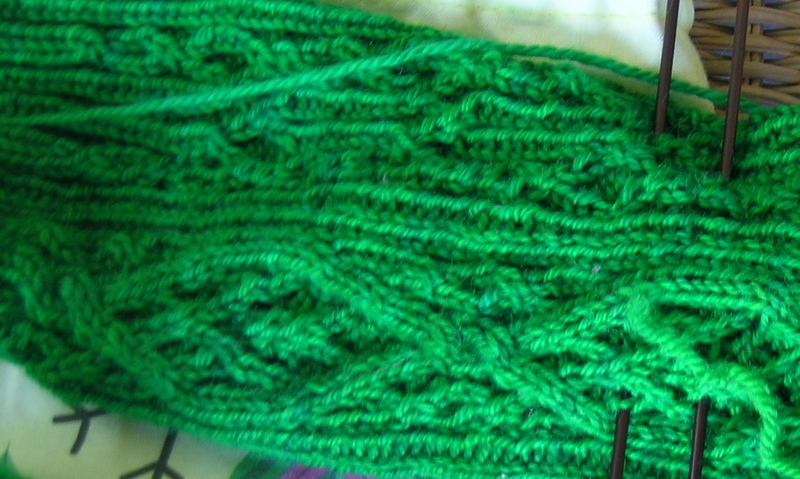 This will be just a scarf, and I think that I will put it in the gift pile. I have it soaking right now, and will block it out later this afternoon. 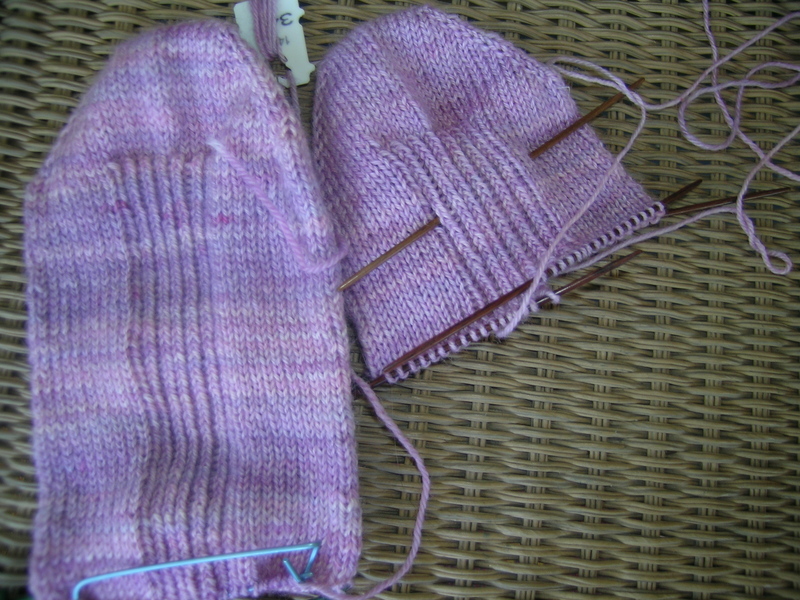 The other project that I made progress on is a mystery sock also by Janel from this months club patterns. 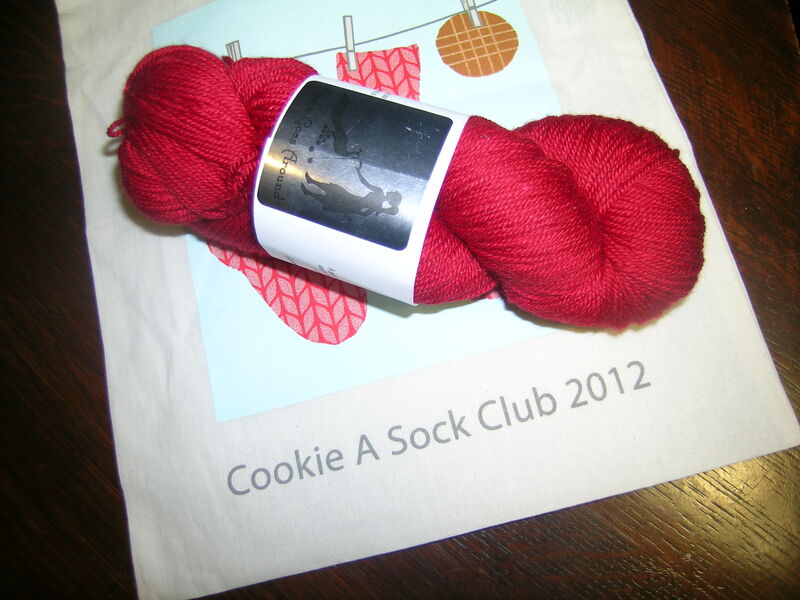 I chose to use the club yarn, Little Red Bicycle, that came with the shipment. 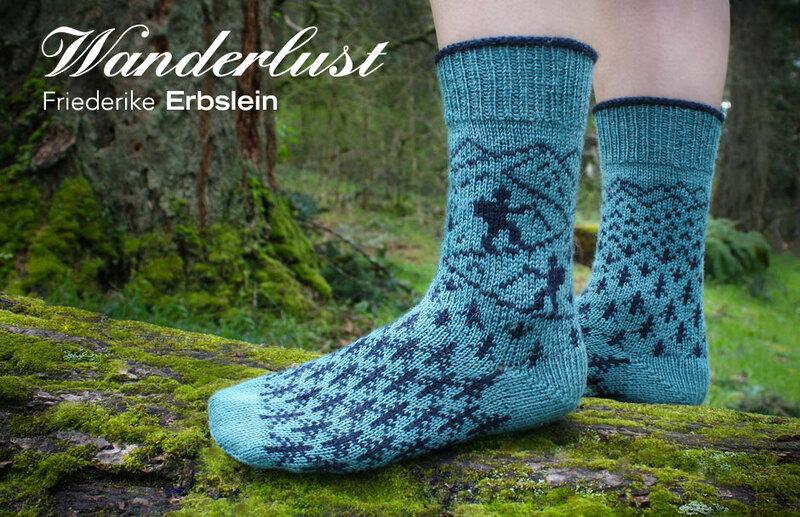 The first clue on both socks is almost complete, and the second clue came out on Friday. I am anxious to get to that as it starts to become very interesting. While in Detroit, in addition to seeing the many great new friends that I made thanks to Judy, Bob took us to the Eastern Market on Saturday morning. What an amazing place, I had not been there since college whcn it had become a bit seedy and unkempt. 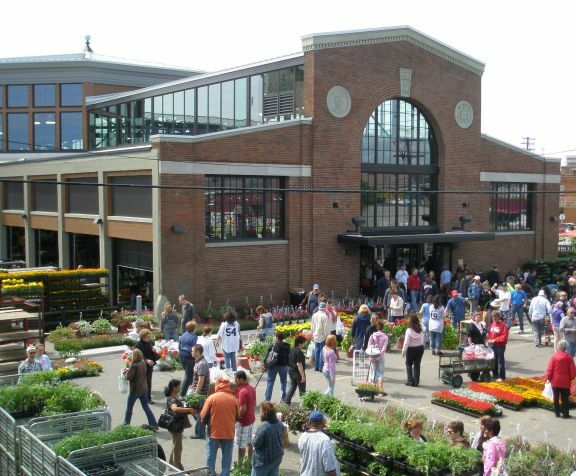 A group has been restoring all of the sheds and it is beautiful, vibrant and packed with produce, flowers and people. Bob took this photo of Dan and I and in the background you can see the interior of one of the beautifully restored buildings. 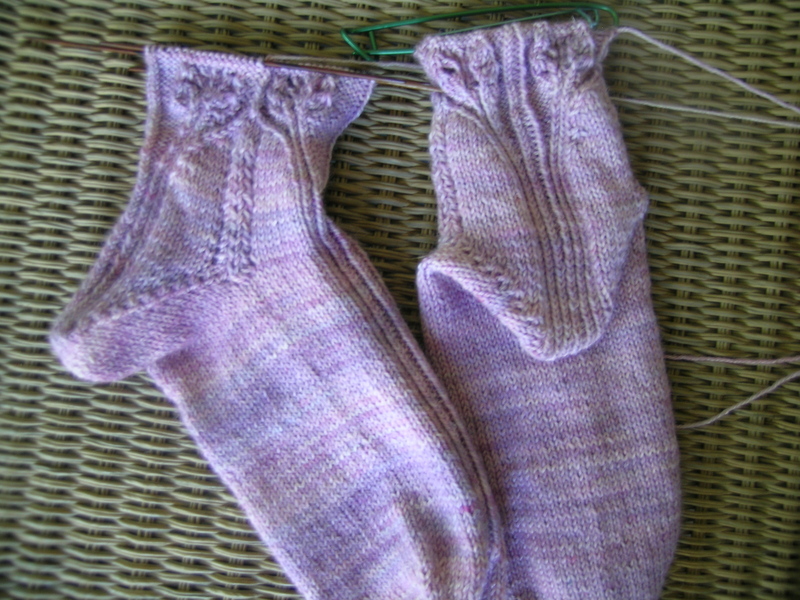 I like the color of the socks, be sure to post the finished project. 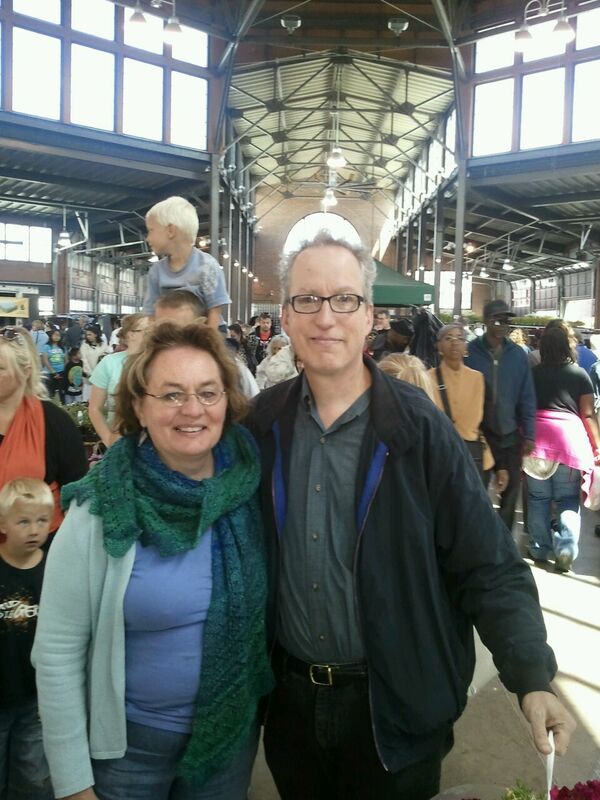 The picture of you and Dan is very good, would love to go to the Eastern Market someday–looks like fun! 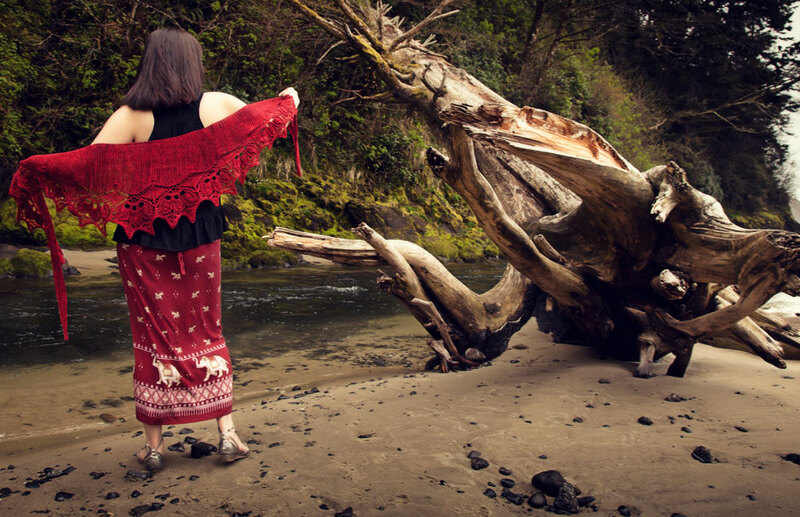 You have most likely heard of yarn bombing, covering a tree or other urban object with knitted fabrics. 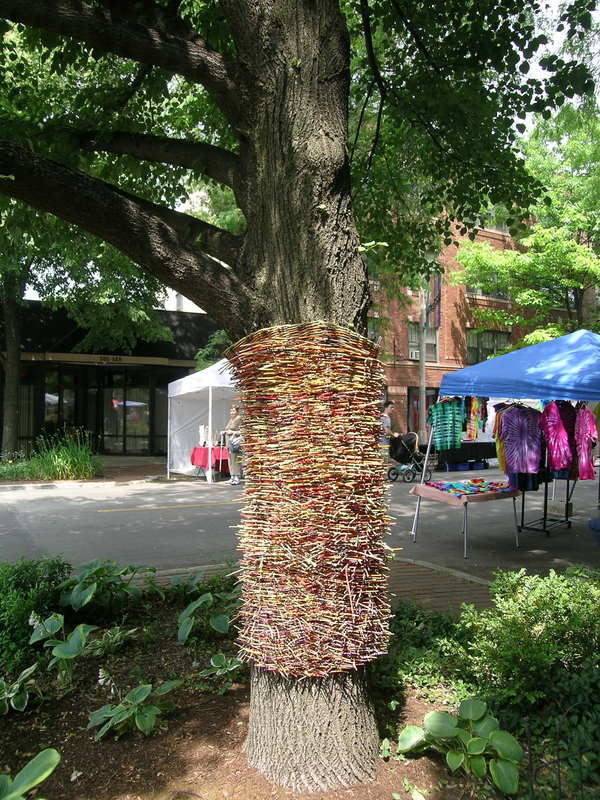 In the local Arts District, a local artist, Karen Gubitz of Woven Earth created baskets for these two trees just outside the gallery where she has an amazing exhibit. 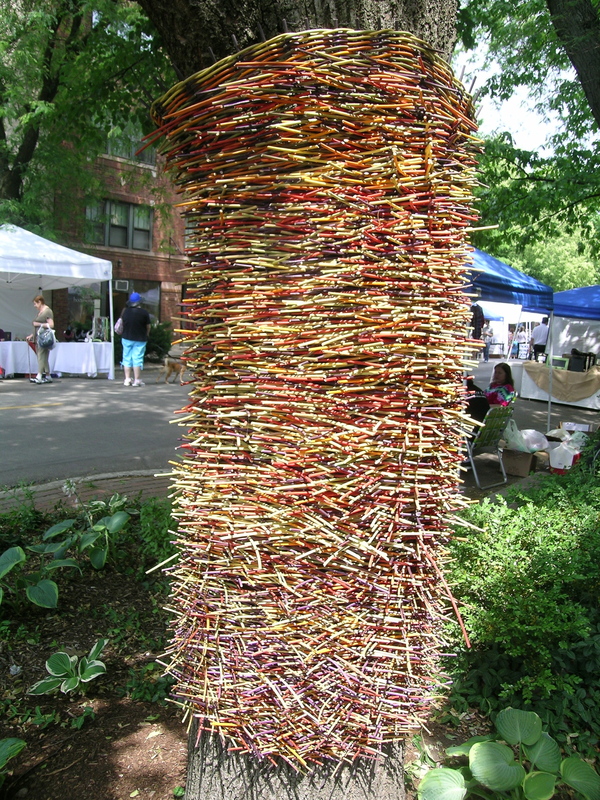 I had watched this installation going up (I walk right by it on my way to my local knit night), and was reminded of it by Tricotreat’s blog post, check it out for some great in-progress photos. 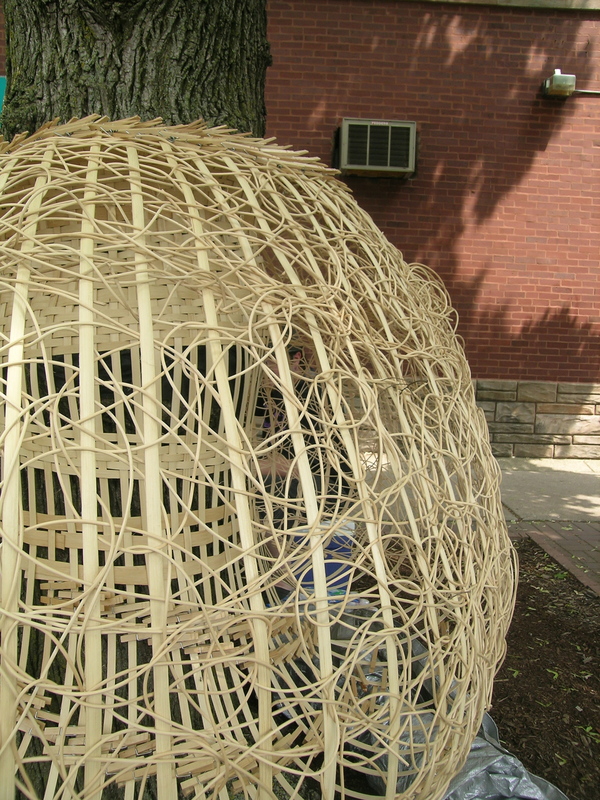 On June 9th I have signed up for a woven trellis building class through the local Park District at our amazing little conservatory, and I had a suspicion that it was the same artist. I was very excited to find out that I am right. 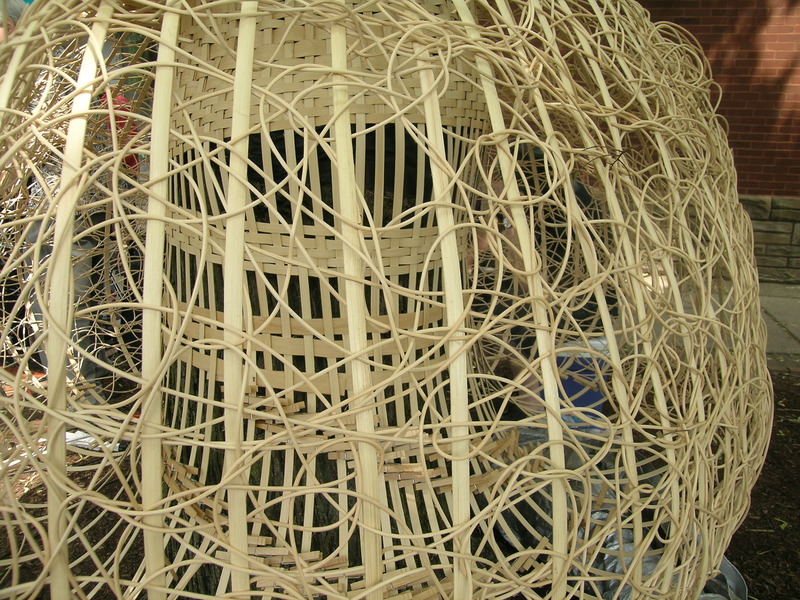 Now, I am debating also taking her 4 week basket making class. If you live in the area, you should definitely attend this show at Janice Elkin’s gallery on Lombard & Harrison. One of the best local shows I have seen. I wish that I had both the money and space for one of her art objects. 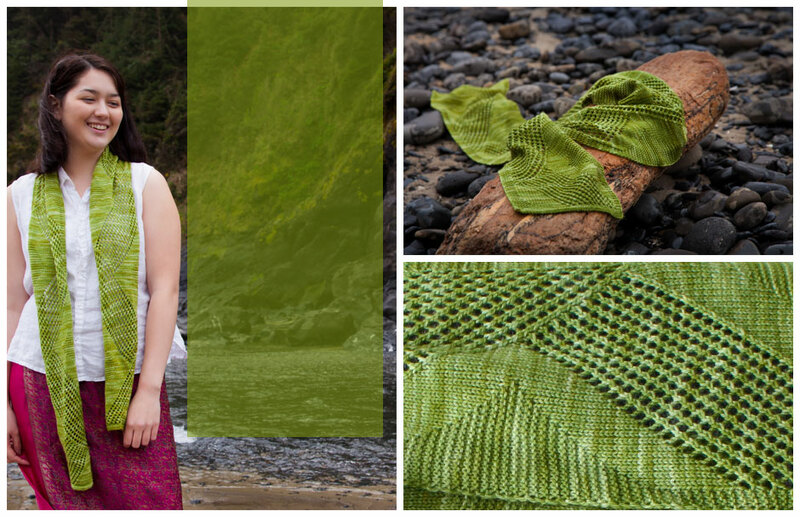 On the knitting front I received my May installment from the Knitteratus sock club by Janel Laidman. 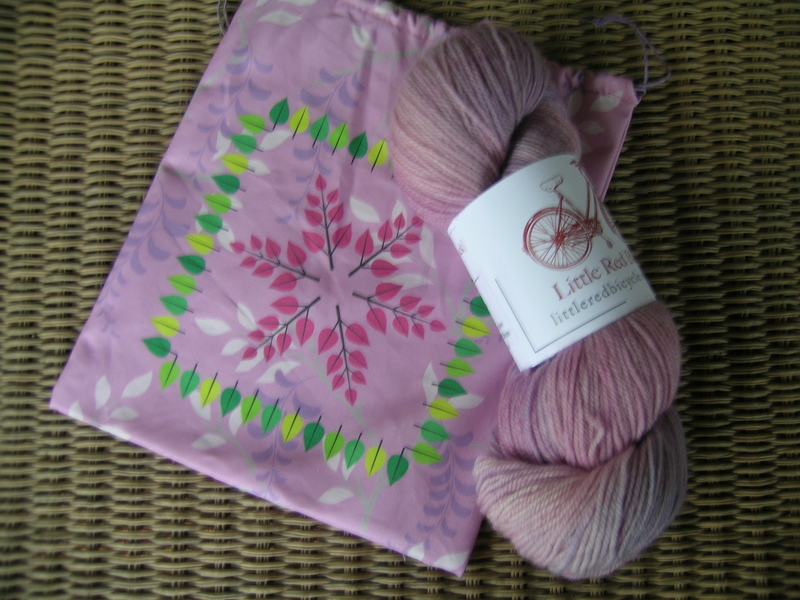 The yarn is from Little Red Bicycle (80% BFL, 20% nylon), color: Heliotropium, another fun project bag, stitch markers and note card. The club always features a pattern and a mystery project. 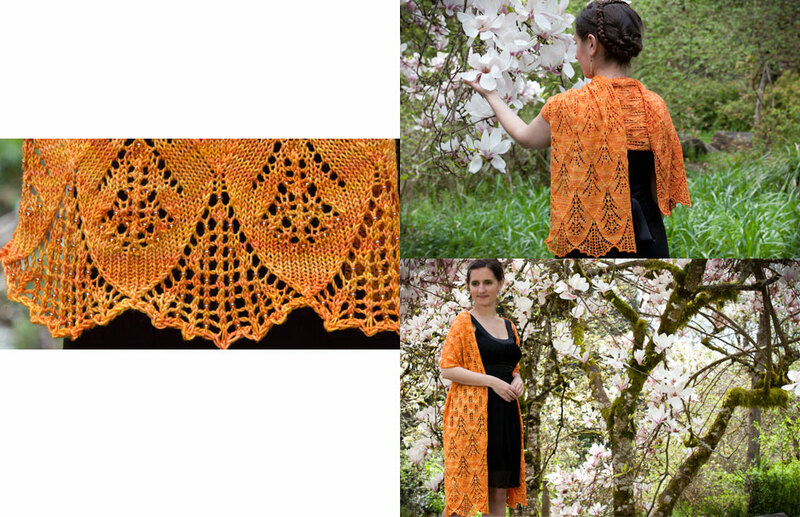 The main pattern this month is a shawl that was shown knit out of this yarn. 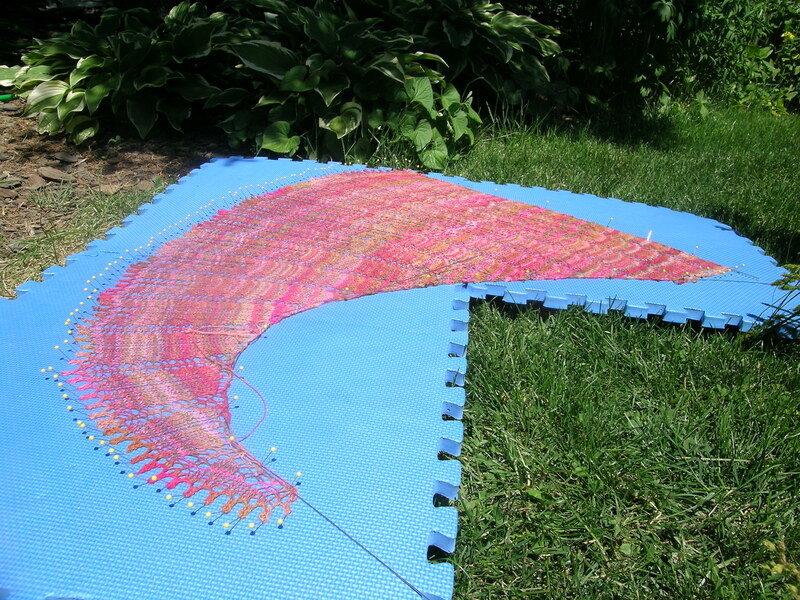 I have chosen to save the club yarn for the mystery socks and knit the shawl out of this handpsun, which is a Fiber Optic yarn from her pencil rovings. 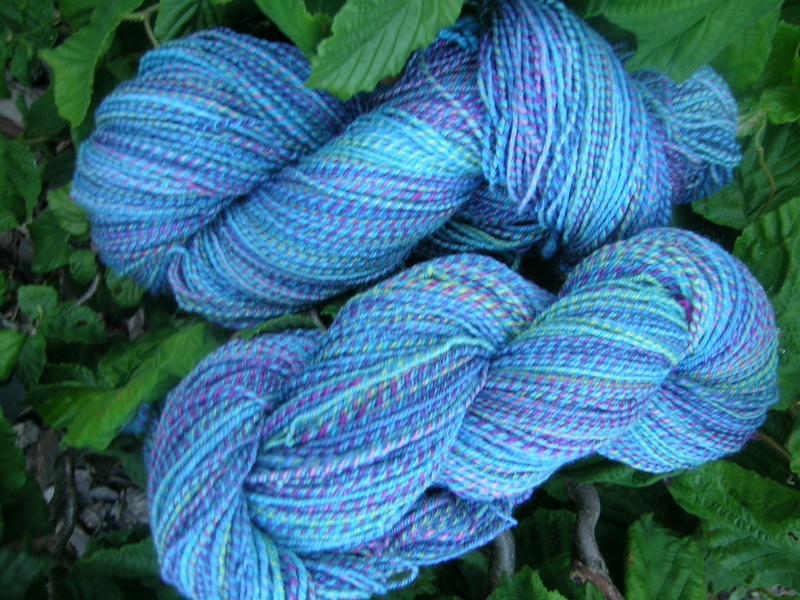 You can see more on my previous posting about this yarn. 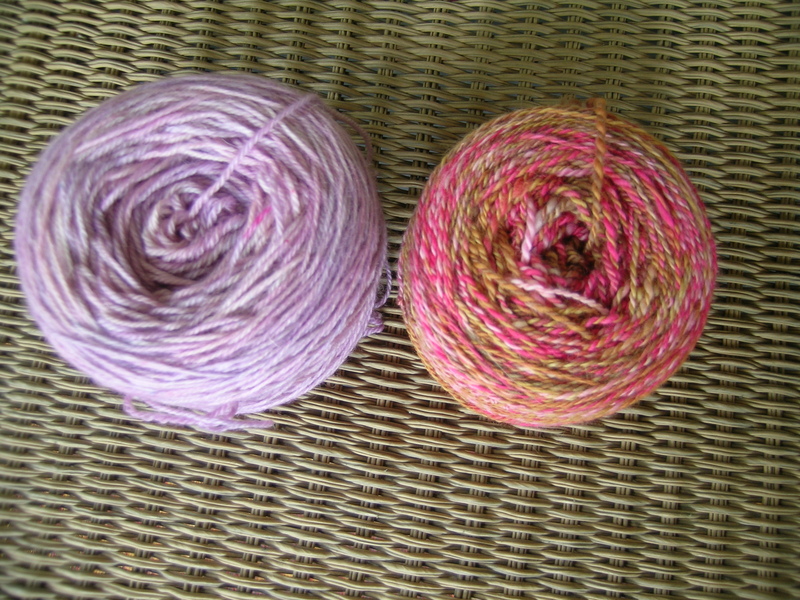 Here are both wound up and ready to knit. 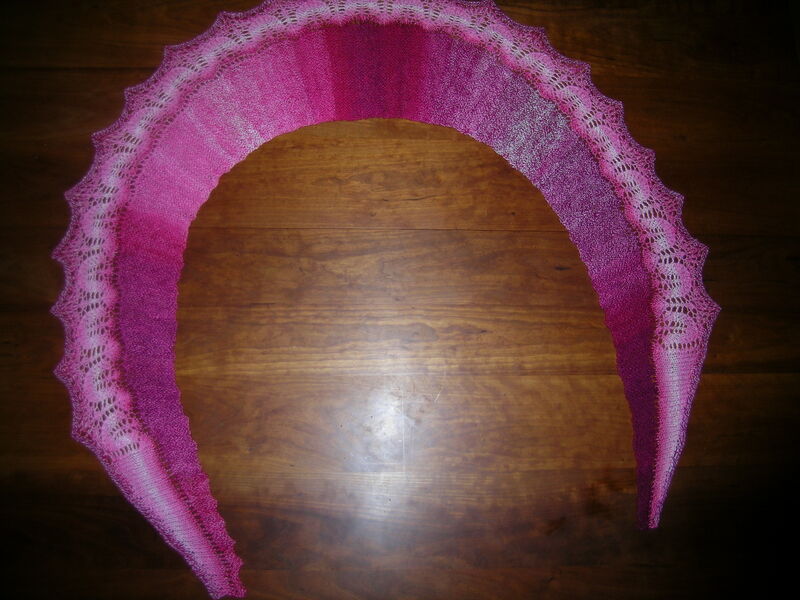 And the first section of the shawl complete. So excited that you’ll be in my class. Thanks so much for the comments. You are welcome! I am excited to be in your class. I am thinking of making the plunge for the basket class also. Your exhibit was extraordinary.